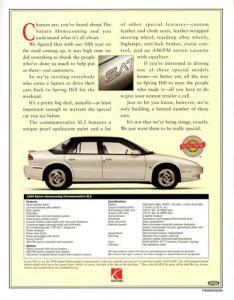 Click the following two links to view the front side and back side of brochure. Read an excerpt from the brochure below. Chances are, you've heard about the Saturn Homecoming and you understand what it's all about. We figured that with our fifth year on the road coming up, it was high time we did something to thank the people who've done so much to help put us there - our customers. So we're inviting everybody who owns a Saturn to drive their cars back to Spring Hill for the weekend. It's a pretty big deal, actually - at least important enough to warrant the special car you see below. the commemorative SL2 features a unique pearl opalescent paint and a lot of other special features - custom leather and cloth seats, leather-wrapped steering wheel, teardrop alloy wheels, foglamps, anti-lock brakes, cruise control, and an AM/FM stereo cassette with equalizer. If you're interested in driving one of these special models home - or better yet, all the way to Spring Hill to meet the people who made it - all you have to do is give your nearest retailer a call. Just to let you know, however, we're only building a limited number of these cars. It's not that we're being stingy, exactly. We just want them to be really special. GMnext contributor Matt Kelly talked to Larry Nitz, GM's executive director of powertrain engineering, at "Plug-In 2008" in San Jose, California last month about the upcoming Saturn Vue Plug-In Hybrid. He was excited by what he heard and saw. "The vehicle's lithium-ion battery will allow it to double its fuel economy for about 20 miles," Kelly wrote on the GMnext blog.